Oak Bluffs selectmen took a stand on several regional issues at their annual town meeting. 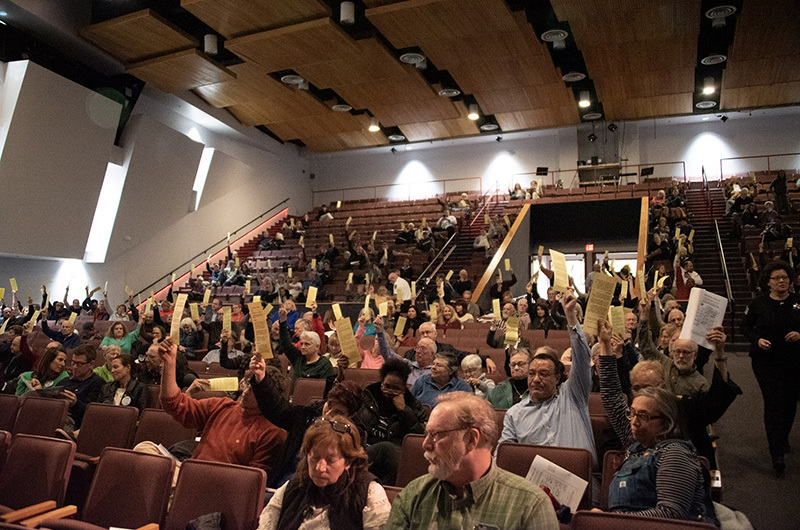 Oak Bluffs voters were in a rebellious mood at their annual town meeting Tuesday. After long and spirited debate, they defeated the housing bank proposal, rejected a request for money to study repair or reconstruction of the Martha’s Vineyard Regional High School, trimmed a request for funds to maintain a new emergency radio system, and passed a measure that would allow more local control over pesticide spraying. They approved a $30.9 million operating budget with almost no dissent. 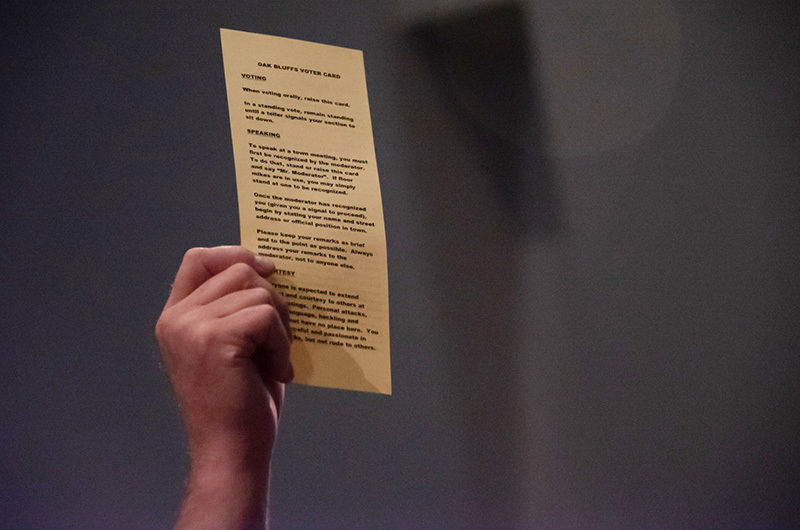 Controversial local issues drew a large crowd to the town meeting this year. When moderator Jesse (Jack) Law 3rd began the meeting, a line of voters was still waiting to check in. The opening gavel was delayed until 7:16 p.m. Eventually 345 voters filed into the high school Performing Arts Center, representing nine per cent of the town’s 3,825 registered voters. The two housing bank articles were last on the warrant but first when measuring the length and passion of the debate. The proposal would have established a new agency modeled after the Martha’s Vineyard Land Bank, funded by 50 per half the revenue from a newly enacted tax on short term rentals, as well as the current tax on hotel and motel rooms. Richard Leonard, active in the grassroots group Housing Bank MV which submitted the articles by petition, framed the proposal as a once-in-a-generation chance to solve the housing crisis. 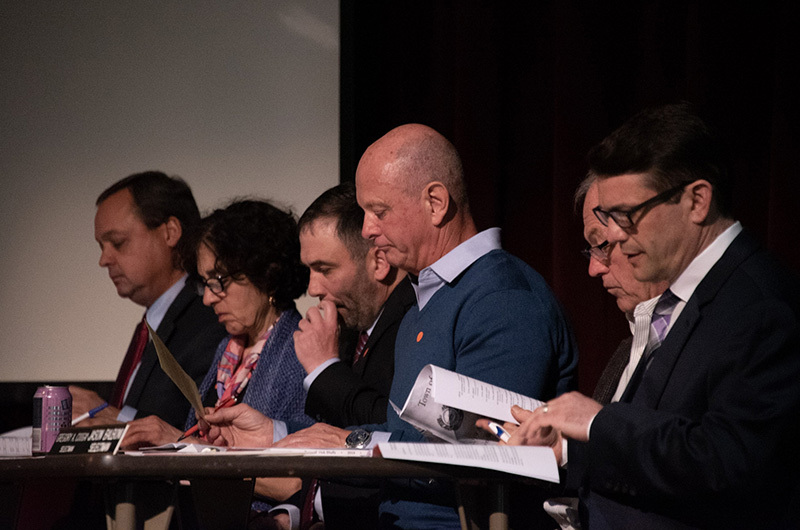 “If we’re serious, and willing to work together as kindred Island towns, marshaling our resources with money and talent to creatively and collaboratively address the Island wide problem, now is an opportunity,” he said. But town administrator Bob Whritenour, speaking on behalf of the selectmen, outlined the board’s objections to the proposal. Speaker after speaker lined up at the microphone to participate in the debate, which touched more than once on the issue of regional versus local control. Ewell Hopkins, chairman of the Oak Bluffs planning board, had another view. Eventually Mr. Law called for a vote. The housing bank was defeated 197 to 71. A second article to create a funding mechanism for the housing bank was withdrawn. 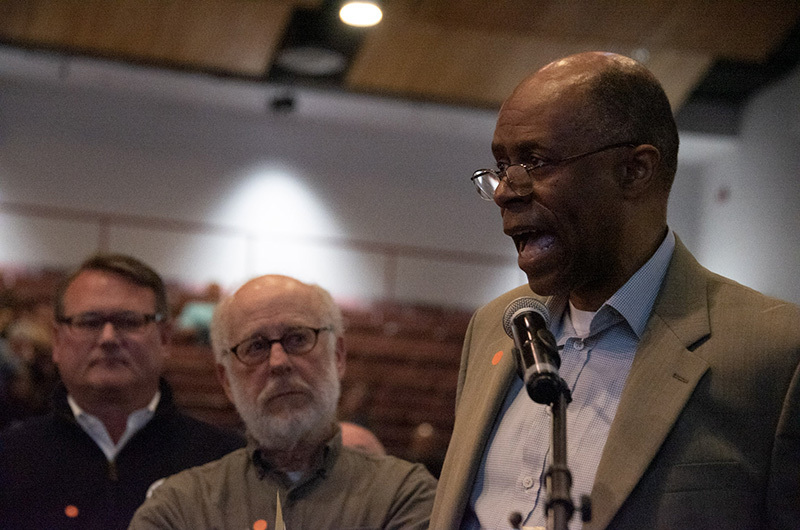 Earlier in the meeting there was also considerable debate around a request for funding for a feasibility study to determine the scope of repair or rebuilding necessary for the ailing regional high school. Assistant superintendent Richard Smith outlined the need for improvements at the school, and the need for a $1.4 million study to determine what needs to be done and how much it might cost. The Oak Bluffs town share of the cost would be $292,723. 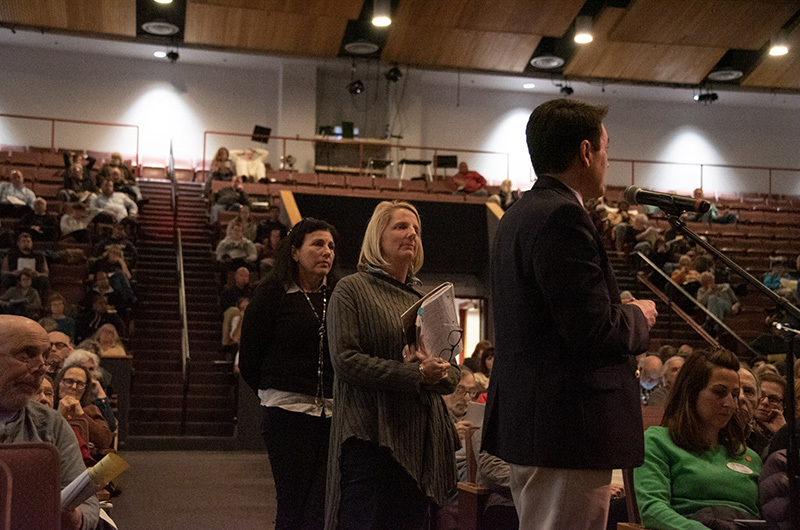 Two members of the town school committee urged voters to reject the funding request as a way to protest the regional formula that is used to divide costs. The formula is based on enrollment. The request for funds was defeated overwhelmingly in a voice vote. Voters also decided to reduce a funding request from the Dukes County sheriff, who is asking all six towns to share the cost of maintenance for a new emergency radio system. The infrastructure will be paid for by a state grant, but the grant does not cover maintenance. Here again, the funding formula was the obstacle, for different reasons. The formula calls for half the cost to be shared equally among the six towns, and the other half to be shared based on the emergency call volume originating from each town. Town officials say the formula is unfair. “We’re netting out the calls from some of the regional agencies that all of the other Island communities use just as much as we do, such as the hospital and the high school,” Mr. Whritenour said. Selectman Gail Barmakian offered an amendment to reduce the requested $56,518 to $54,720.45. The amended article was approved. A home rule petition that would give the Oak Bluffs board of health more say in the use of herbicides won easy voter approval. The petition is rooted in recent objections to herbicide spraying under power lines by the public utility Eversource. Tisbury and West Tisbury approved similar petitions last year. Edgartown defeated the question on Tuesday night. Chilmark is due to consider a similar article at its annual town meeting next month. • $78,098 for various social services administered by Dukes County. The evening’s most poignant moment came during discussion of a $19,782 expenditure for a study to find predators for an invasive toxic jellyfish in Farm Pond and other Oak Bluffs waters. The study money was approved, but during discussion selectmen acknowledged the upcoming retirement of shellfish constable David Grunden after 19 years of service to the town. Mr. Grunden received a sustained standing ovation from voters. Here,here to the OB selectman.Stand firm financally when and where you can. I must be missing something here....if the current funding methodology for MVRHS is the costs, divided by number of students, then allocated to each town by student residency, how is that unfair? That formula would seem to me to be the most transparent way of dealing with it. I would be interested in hearing how our friends in OB are feeling aggrieved Ms. O'Brien?